Imagine your best friend kills herself without warning. In her suicide note, you find clues leading you to a place. At that place you discover another clue, leading you further. Then another…then another. And the further you go, the more you doubt everything you know about your friend. That’s what happens to Ben Constable (the author is the narrator). He’s shocked one day to receive a suicide note from his friend Tomomi Ishikawa, more commonly known as “Butterfly.” He is instructed to go get the laptop computer from her apartment. He returns home to find a letter has been slid under his door. The letter is from her, telling him that she’s left him clues in the computer, leading him on a sort of quest. He retrieves the computer and scours its files. He finds clues, follows them, and–solving cryptic hints and riddles–finds that he’s supposed to continue his chase to her hometown, New York City. So, Ben flies from Paris to New York, where he picks up the trail anew. Via his scavenger hunt, he gets a broad tour of New York City. Indeed, he digs in traffic islands, gropes between folds in a statue’s clothing, even destroys a library book on chicken farming. When he solves each clue, he finds a notebook filled with Butterfly’s unique scrawl. Each of these notebooks describes a killing of some varying degree of horror. With each clue–and each notebook–Ben becomes less sure of how well he knew his Butterfly. The deeper he gets into her dark past, the more certain he becomes that he’s being followed around New York, and that greater forces are at play. More worrisome still, he begins to wonder whether his friend Tomomi Ishikawa is really dead at all. 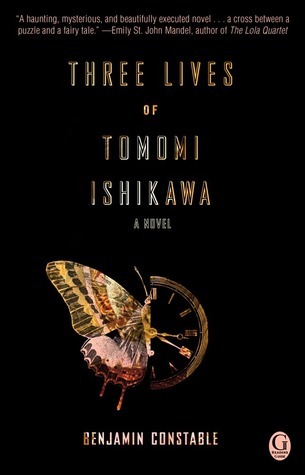 “Three Lives of Tomomi Ishikawa” is what I would call a snowball novel. It starts out as an interesting-enough character study. We don’t really get a sense of Butterfly before her suicide, and from Ben’s narration, we see her as somebody who drank and smoked a lot, and who had a propensity toward moodiness. The two weren’t romantic, and there were even gaps in their platonic friendship following some drunken snit or another. We don’t know much about Ben at first, either. He really begins to come alive as a character (and a person) once he delves into Butterfly’s odd, posthumous scavenger hunt. We sense, though, that she’s the one thing that added any sort of real excitement–good or bad–to his life. The odd thing about Butterfly’s mission, is that it doesn’t seem like a final gift to Ben to show how much she loved him, but rather a sort of statement that he didn’t really know her one damned bit. Benjamin Constable (the author) has created an engrossing story here. We learn that Butterfly had a tough childhood, during which she was raised to perform some horrifying duties when the time came. This changed her, isolating her from the rest of society. This is why we–like Ben (the character)–are so shocked to learn, not only of the horrors Butterfly may have committed, but at the deep subterfuge she undertakes to reveal them to Ben. Be forewarned: once it has its hooks in you, “Three Lives of Tomomi Ishikawa” is a very difficult book to put down. This entry was posted in Books, Literary or Genre Fiction, Mysteries/Thrillers and tagged Benjamin Constable, booksandmoviesandcrap.com, Three Lives of Tomomi Ishikawa. Bookmark the permalink.